VCR not included with system. We were just talking about this horror in the chatbox!!! I mean a console that uses a VCR to play games, if you can call them that! I played on one of these once, it was one time too many! Ha! I have been afraid to admit I own one. I have one more game tape for the system. What do you think of it then? I'm glad I only paid $5.00 for the system. I do like light gun games but think the sensor could have been built better. It actually looks really cool.. Love it and first i have seen or heard of it. Must be a pain to play games that are VCR-based. What do you think of the game that you do have, Ice? .38 Ambush Alley starts out you at a police target training area. Your greeted by an officer who looks and sounds like a tougher version of Barney Fife from the Andy Griffith show. 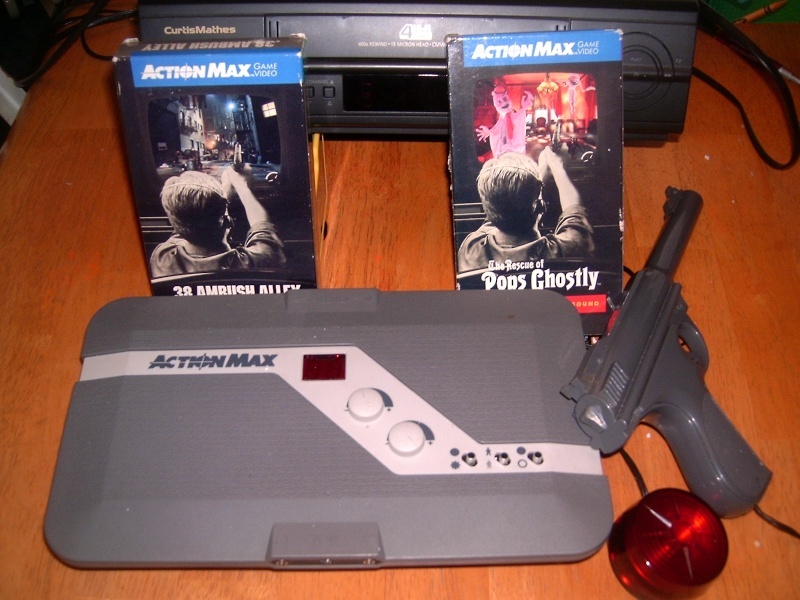 VCR -based makes it hard plus you have to find a TV that accepts light gun games. These newer sets do not seem to work well with old light sensors. I have been curious if any problems would occur if I transfered the vcr tapes to dvd. Those videos are great! Makes me want to run out and buy another system. I had never seen the Blue Thunder video. Reminds me of an old tv show similar to Airwolf that had a helicopter and starred the guy from the movie Jaws. Yes, that was the Blue Thunder TV show which this is based on! Ok, I thought that it was called by the same name. So many helicopter games back in the 1980's. Airwolf, Blue Thunder, Chopper Command, Choplifter, Infiltrator and Super Huey to name a few. [align=center:gu49fmcs]James & Mike have made a new video looking at the Action Max!